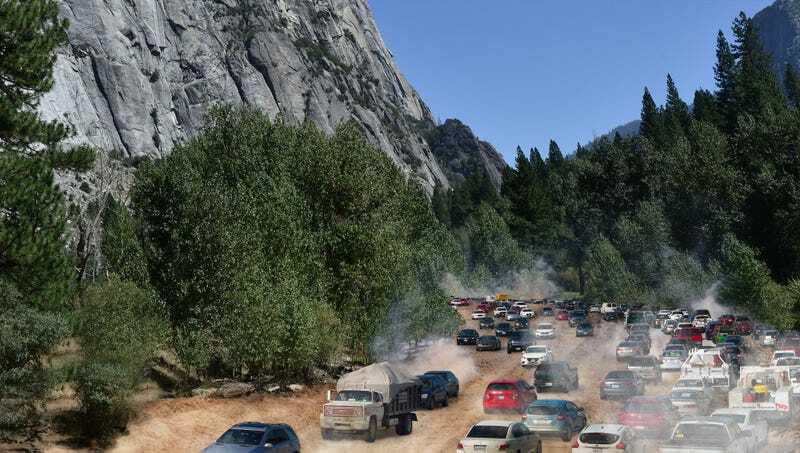 YOSEMITE VILLAGE, CA—Hailing it as an exciting new way to experience the park in all its glory, Yosemite National Park announced Friday that it had completed construction of a new six-lane scenic driving trail. “We’re proud to announce the opening of our new six-lane Sierra Heritage Supertrail, which will traverse such amazing landmarks as Mariposa Grove, Glacier Point, and El Capitan, all in under 45 minutes,” said Yosemite spokesman Scott Gediman, adding that a rotary atop Half Dome will allow drivers to slow down to take pictures without the inconvenience of exiting their vehicles. “Visitors can roll down their windows and experience the fresh air from each of the park’s five different vegetation zones as they cruise by majestic waterfalls and awe-inspiring valleys at 60 miles per hour. And keep an eye out for the diverse wildlife that lives within Yosemite, because the trail winds through all the major animal habitats.” At press time, traffic had slowed to a crawl at Sentinel Rock as six lanes of vehicles merged to pass through the single manned toll booth.